Hotel is located in edge of the Ranthambore Tiger Reserve and amidst the lush green Aravali hills. This is most renowned National park in the world and around 180 km from Jaipur which is approx four hour journeys. The hotel is spread over 4000 sq meters. There is a well maintained sprawling lawn with beautiful garden. It gives natural environment and peace to mind of guests. 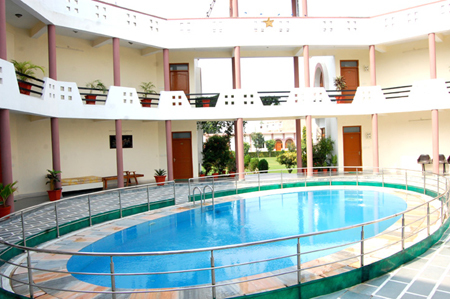 The Main attraction of the hotel is central swimming pool. Hotel has helpful and cooperative Staff with Nice Hospitality. The resort is equipped with requisite modern amenities for your comfortable stay. The Hotel provides comfortable accommodation and high end facilities with personal touch. You can thoroughly enjoy at Sanctuary resort during your Ranthambore wildlife tour. There are three types of accommodation in sanctuary Resort. These categories are - Deluxe, Super deluxe and Superior rooms. All rooms have lush green garden view with beauty of nature which is elegantly maintained for guests. All rooms are furnished with modern amenities such as bespoke and well-mannered room service, running hot & cold water, attached bathroom; electricity backup. You can enjoy a cultural evening around the lush green lawn or swimming pool, performed by local artist in the resort. There is a multi cousin restaurant where you can have all Indian taste and others like Chinese and Continental dishes. A comfortable stay offers to you a feeling of being at home away home. Elegantly maintained lush green lawn.